Allegro is a musical by Richard Rodgers (music) and Oscar Hammerstein II (book and lyrics), their third collaboration for the stage. Opening on Broadway on October 10, 1947, the musical centers on the life of Joseph Taylor, Jr.—Joe follows in the footsteps of his father as a doctor, but is tempted by fortune and fame at a big-city hospital. After the immense successes of the first two Rodgers and Hammerstein musicals, Oklahoma! and Carousel, the pair sought a subject for their next play. Hammerstein had long contemplated a serious work which would deal with the problems of the ordinary man in the fast-moving modern world. He and Rodgers sought to create a work which would be as innovative as their first two stage musicals. To that end, they created a play with a large cast, including a Greek chorus. The production would have no sets; props and projections served to suggest locations. After a disastrous tryout in New Haven, Connecticut, the musical opened on Broadway to a large advance sale of tickets, and very mixed reviews. Agnes de Mille, the choreographer of Rodgers and Hammerstein's previous Broadway productions, both directed and choreographed the work. The show was viewed as too moralistic, and the Broadway run ended after nine months; it was followed by a short national tour. It had no West End production, and has rarely been revived. Allegro has been recorded twice, the original cast album and a studio recording released in 2009. This ensemble musical chronicles nearly four decades in the life of an Everyman, Joseph Taylor, Jr., from cradle through a mid-life discovery of who he is and what his life is truly about. The first musical to be staged by a director who was also the choreographer (the legendary Agnes de Mille), the unique structural format allows the saga to whisk us from Joe's birth through his childhood, from college dorm to marriage altar, and on to his career; from the tranquility of his small Midwestern hometown to the hectic din of big city life, in a series of vignettes and musical sequences dazzling in their simplicity and stunning in their impact. Ahead of its time theatrically, ALLEGRO remains timeless in its appeal. Oscar Hammerstein II had always wanted to write a serious drama, one which would address the problems of life confronting ordinary people. By early 1946, four years after his partnership with Richard Rodgers commenced, the duo had two hits (Oklahoma! and Carousel) on Broadway, and had success as producers of musicals others had written. In March, Hammerstein approached Rodgers with the idea for a play with two men as the central characters, rather than the usual "boy and girl" format. Over the following weeks, the two discussed it, and the concept evolved into a musical about one man, a doctor's son. The concept appealed to Rodgers, the son and brother of doctors. By September, the general theme for the story had been established: the struggle of the main character to avoid compromising his principles as he progresses in life. Hammerstein had thought of writing a play about a man, from birth to death. However, having just killed his leading male character, Billy Bigelow, onstage in Carousel, he was reluctant to kill off another. In the end, he took his protagonist from birth to age 35. He envisioned a simply staged work like Our Town which after its initial run would lend itself to college productions. Allegro was conceived as taking place in an open space, using props and projections to convey scenery to the audience. In addition to the customary singing chorus, there would be a speaking chorus, in the manner of a Greek chorus, which would comment on the action, and speak to both characters and audience. Hammerstein did background research about the medical profession by interviewing his own doctor. He wrote a few pages of the book before embarking with his wife for Australia to visit his mother-in-law; when his ship arrived in Brisbane he mailed Rodgers part of the remainder. On receiving the packet, Rodgers, who did not compose until his lyricists supplied him with the words, immediately sat down and composed three songs. Hammerstein put a good deal of his own experiences into the play. According to his son, William, "Most of the first act was based on his own memories of his own childhood. He had always been intrigued by it, you know; his mother died when he was twelve. I always felt his songs came out of his feelings about her." Hammerstein spent a year writing and polishing the first act, taking infinite pains over the wording. The second act was more rushed; under a deadline, Hammerstein completed it only a week before rehearsals began. Stephen Sondheim, who served as a $25-a-week gofer on the production, stated: "Years later, in talking over the show with Oscar—I don't think I recognized it at the time—I realized he was trying to tell the story of his life ... Oscar meant it as a metaphor for what had happened to him. He had become so successful with Oklahoma! and Carousel that he was suddenly in demand all over the place. What he was talking about was the trappings, not so much of success, but of losing sight of what your goal is." The duo hired choreographer Agnes de Mille to direct—a move between two theatre functions which was unusual at the time. De Mille had been the choreographer for the dances in Oklahoma! And Carousel, designing ballets which disclosed the characters' psychological states to the audience. She had been concerned about the cohesion of the script as she received it from Hammerstein. When a few days before rehearsals began, she asked Hammerstein what the show was about, the lyricist replied, "It's about a man not being allowed to do his own work because of worldly pressures." De Mille answered, "That's not the play you've written. You haven't written your second act." Hammerstein replied, "But we're already committed to the theatre in New York." De Mille faced an immense task. Instead of conventional sets, locations were suggested by platforms, images projected onto backdrops, and lighting—there were 500 lighting cues, at the time a Broadway record. There were forty stagehands, needed to shift sixty partial sets, with objects moved onto the stage by a semicircular track hidden by an elaborate series of curtains. According to de Mille biographer Carol Easton, "Allegro was a leviathan of a show, on a scale exceeding the grasp of any individual." Rehearsals took place in three New York locations, for principals, singers, and dancers. The production contained 41 principals and over a hundred dancers. De Mille also choreographed the dances, which were both extremely complicated and provided the framework for the scenes which made up the show. During the dances, Joe learns to walk, falls in love, goes astray, and then gets back on the proper track. De Mille used adults in children's clothes for the dances when Joe is a child; since there were no actual children on stage to provide scale, the illusion worked. The dance which accompanied "One Foot, Other Foot" was based on de Mille's own experiences in watching her own son Jonathan learn to walk. Sondheim later expressed his view of de Mille's directing, calling her "a horror. She treated the actors and singers like dirt and treated the dancers like gods … [she was,] I think, an extremely insensitive woman, an excellent writer, and a terrible director, in terms of morale, anyway. That was my first experience of bad behavior in the theatre." However, Rufus Smith, who played the minor role of the football coach, stated, "Never again in my life will I experience what it is like to stop a show cold, by doing exactly what she taught me". The immense job of directing the play finally proved too big for de Mille, who stated "I can't do the new dances and the new songs and the new book," and Hammerstein stepped in to direct the dialogue. According to Rodgers biographer Meryle Secrest, at this point the cast was up in arms over de Mille's treatment of them. James Mitchell, one of the dancers in the production, later stated that de Mille was better at directing dancers than actors, as actors come to the stage with preconceived notions about how to play a part, and dancers do not. The first tryout, in New Haven, Connecticut, did not go to plan. During the first act, William Ching, playing Joseph Taylor, Sr., was singing "A Fellow Needs a Girl" when the scenery wall began to collapse, forcing him to hold it up until the stagehands noticed. Dancer Ray Harrison caught his tap in a track in the stage, and tore the ligaments in his knee. He was carried from the stage, screaming. Lisa Kirk, the first Emily, fell into the orchestra while singing "The Gentleman is a Dope". She was catapulted back onto the stage with no pause in her singing, to great applause by the audience. Sondheim remembered: Next day in the New York Herald Tribune … Billy Rose, of all people was saying, "A star is born." Next night she comes back, came to the same point in the song, and starts to fall, and the entire audience gasps because they'd all read the Herald Tribune. She recovers quickly, they all sigh, and she gets another ovation. Oscar came backstage at the end and said, "You do that a third time and you're fired." The disasters of the New Haven opener concluded during "Come Home", a song near the end the play—the quiet urgings of the chorus and Joe's mother to entice him to return to his small town. A false fire alarm went off, and the audience began to push towards the exit. Joshua Logan, who was in attendance, loudly ordered the crowd to sit down, which it did. One of the Boston tryouts which followed New Haven was marked by boisterous behavior by conventioneers, until Hammerstein yelled, "Shut up!" and the audience subsided. Given the outstanding success of Oklahoma! And Carousel, Allegro was anticipated with close interest by the theatre community and public. The musical attracted $750,000 in advance sales, at a time when the top price ticket for a Broadway musical was $6. Allegro opened on Broadway at the Majestic Theatre on October 10, 1947. It starred John Battles as Joseph Taylor, Jr., Annamary Dickey as Majorie Taylor, William Ching as Dr. Joseph Taylor, Roberta Jonay as Jenny Brinker, Lisa Kirk as Emily, and John Conte as Charlie Townsend. A special performance the afternoon of the opening for friends and associates generated wild applause; the audience at the official opening that evening clapped little. As de Mille's husband, Walter Prude, put it, Allegro went over "like a wet firecracker". The mixed reviews prompted ongoing discussions of the play's merit, continuing well after the first night. Some of the news that the show generated had nothing to do with its worth—de Mille had dancer Francis Rainer fired, and Rainer alleged that the dismissal was due to her union activism. After Actors Equity became involved, Rainer was rehired. More bad publicity came when the producers proposed to dismiss several orchestra and chorus members to cut costs so the show might continue through the summer of 1948, and the fired performers also alleged dismissal for union involvement. The show closed before the summer, and in the fall, a national tour began. The national tour ran eight months, much shorter than that of Oklahoma! Or Carousel. No London production was mounted. According to Thomas Hischak in his The Rodgers and Hammerstein Encyclopedia, the show made a small profit; other sources state that the show lost money. The show was popular in the 1950s among amateur drama societies, because of the large cast with no star and the bare stage. It has rarely been revived professionally: the St. Louis Municipal Opera presented it in 1955; Goodspeed Musicals presented it in Connecticut in 1968. An abridged version was presented Off-Off-Broadway in 1978 by Equity Library Theatre. In March 1994 a staged concert version was presented by New York City Center Encores!, with a cast that included Stephen Bogardus (Joseph Taylor, Jr.), Karen Ziemba and Jonathan Hadary. Christopher Reeve was the narrator, and the concert was directed by Susan H. Schulman. A revised version of Allegro, re-written by Joe DiPietro, who was a protege of Oscar's son James Hammerstein, was produced at the Signature Theatre (Arlington, Virginia) in January 2004. This version cut the musical in size and scale. The cast was cut with some characters being combined; the original, lavish orchestrations were simplified. Aucun dossier informatif complémentaire concernant Allegro. Although Allegro is filled with music, the music is fragmented, as the characters often break into song briefly. The character of Joe was unusual for a male lead of the time in having relatively little to sing; Joe has only one solo number ("A Darn Nice Campus. Important songs are given to minor characters, such as "So Far", given to Beulah, who only appears on the one date with Joe. Author and composer Ethan Mordden calls Rodgers's technique "the deconstruction of theatre music, to match the show's deconstruction of traditional theatre design". Rodgers's music is more subtle than in his previous musicals, and his melodies more muted. The key changes are less dramatic than in other musicals of that time. Rodgers did not intend for the songs to become hits; instead they were designed to draw the audience into the action, as onstage events were described subjectively in song. An original cast recording was released in 1947, heavily abridged. According to Hischak, only Lisa Kirk as Emily shines on the recording, which he calls "sad evidences of a very ambitious undertaking. Originally issued by Victor Records on five 78s, sales were poor; Victor did not reissue it on LP during the rapid transition from 78s to long-playing records in 1949–1950, when most record companies were hastily transferring their entire catalogues onto the new medium. The recording was made available briefly in simulated stereo in the 1960s, and was reissued in the 1970s in the original mono. The original cast recording was released on compact disc in 1993. A studio recording of the complete score was made in 2008, with Patrick Wilson as Joe, and Nathan Gunn and Audra McDonald as his parents. The album, produced by Sony Masterworks Broadway, was released on February 3, 2009. According to musical theatre author John Kenrick, "this all star studio cast glorifies all that is right with this melodious and sometimes adventurous score". They had triumphed their first time out, with OKLAHOMA! In 1943. Two years later they exceeded expectations with CAROUSEL, and, in that same year, charmed Hollywood, winning an Academy Award for STATE FAIR. They had also begun producing: first John Van Druten’s play I REMEMBER MAMA, then Irving Berlin’s blockbuster ANNIE GET YOUR GUN and a tour of SHOW BOAT. By now they were practically deified for making hits by taking chances, and in 1947 composer Richard Rodgers and lyricist/librettist Oscar Hammerstein II seemed as eager as everyone else to see what they would come up with next. The result was ALLEGRO. Preceded by a mammoth publicity fanfare and the largest advance sale in Broadway history, ALLEGRO opened at the Majestic Theatre in New York on October 10, 1947. Drawing a critical reaction unlike any other in the Rodgers and Hammerstein canon, before or since, ALLEGRO proved controversial. Within the context of this critical brouhaha, the show itself remains a fascinating study, as contradictory as the reactions to it. Plot and theme may have been naïve, but the score, structure and staging were absolutely ahead of their time. 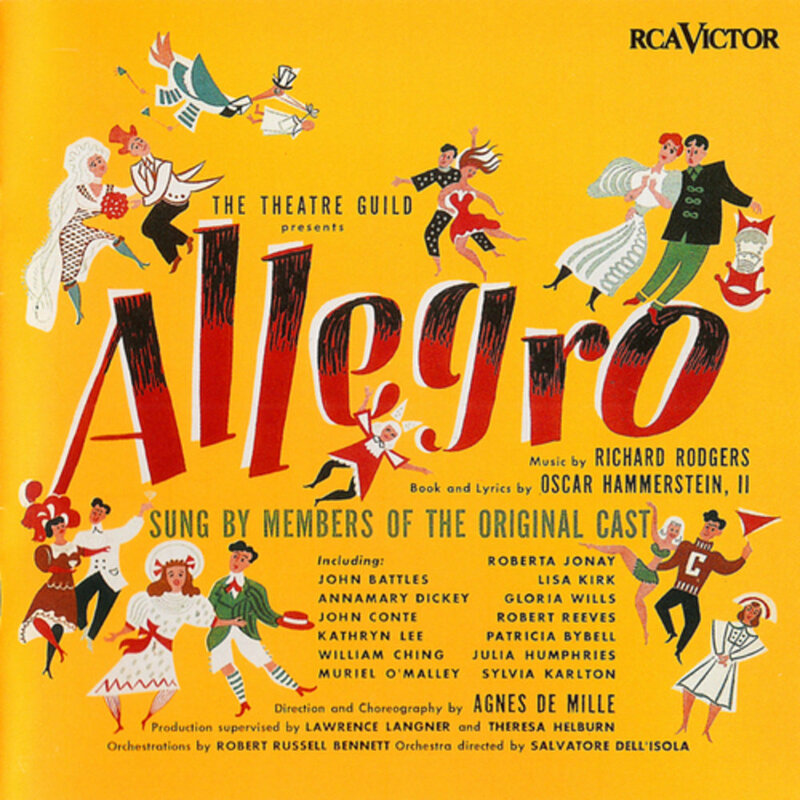 Hammerstein had brought the idea of ALLEGRO to Rodgers and it was the first of only two original musicals by Rodgers and Hammerstein not adapted from another source (the other being ME & JULIET in 1953). Hammerstein had conceived it as an allegory traveling from birth to death, in which he chose to make his Everyman a doctor. ALLEGRO tackles very real concerns about the medical profession: dilemmas that doctors face when a patient’s needs conflict with a hospital’s agenda, the role of big business in medicine, and a doctor’s responsibility to his own community. Rodgers, whose brother and father both practiced medicine, shared his partner’s interest in these issues. As ALLEGRO began to take shape (with the first-draft storyline of cradle-to-grave truncated to cradle-to-midlife crisis), it became obvious that a new approach in script and style would be required to carry the ambitious story. It needed to move effortlessly through time and place; the allegory could only unfold in an atmosphere of total freedom. Both authors acknowledged that their inspiration was Thornton Wilder’s classic of nine years earlier, OUR TOWN, which had freed commercial theater from many of its conventions. ALLEGRO shares with OUR TOWN a common setting (small town America in a simpler time), the use of structural and narrative devices and, above all, a minimalist approach to the design. Having written the rules on the musical play, Rodgers and Hammerstein now set out to break them. ALLEGRO’s score, for example, is filled with innovation, starting from its delicate weaving of song and dialogue, a technique first tried in OKLAHOMA! And perfected in the Bench Scene (“If I Loved You”) from CAROUSEL. In ALLEGRO, fragments of song move in and out of the action like passing thoughts; melodies flit by in one scene only to take hold and blossom in the next. Breaking another rule, big numbers like So Far and The Gentleman is a Dope are given to supporting characters while leads like the hero himself have comparatively little solo work. Also unusual is the presence of a Greek chorus shadowing the cast and requisite corps de ballet, giving insight into the plot, commenting on the action and speaking the character’s inner thoughts aloud. The result was a musical unlike anything that had come before, and it demanded staging equally bold and original. Its fluid blend of score, dance, and book, for instance, required the director and choreographer to think and work as one… in fact, the director and choreographer would have to be one. So Rodgers and Hammerstein asked the innovative creator of their ballets for OKLAHOMA! And CAROUSEL, Agnes de Mille, to do double-duty. The position of director-choreographer was unprecedented; offering it to a woman was extraordinary. Agnes de Mille said yes. Conceptually, ALLEGRO was a simple show. But simplicity in the theater can be awfully complicated. Jo Mielziner’s sets and lighting achieved an illusion of effortless motion through a complex system of treadmills, moving platforms, screen and projections supporting a highly sophisticated lighting plot (the first time lighting served as the principal staging factor in a Broadway musical). Added to the massive production budget was a weekly payroll for forty stagehands, eighteen principal actors, twenty-one supporting players, twenty-two dancers, thirty-eight singers and thirty-five musicians. ALLEGRO was not only expansive but expensive. Rodgers and Hammerstein’s fourth collaboration opened at the Shubert Theatre in New Haven on September 1, 1947, and traveled from there to Boston before opening in New York, where expectations were extraordinarily high. Following OKLAHOMA!, CAROUSEL and STATE FAIR was a tough assignment; landing on the covers of Life, Time, and other publications didn’t make it any easier. Avid theatergoers, having to wait years for their chance to see the other Rodgers and Hammerstein stage shows, were determined not to be left out in the cold this time. They snapped up tickets to ALLEGRO in record-setting numbers, resulting in the largest advance sale in history: $750,000 on a $4.50 top ticket price, at a time when a $100,000 advance was considered astronomical. The advance sale helped for a while, as did the good and great reviews (of which, contrary to common assumption, there were quite a few). But the bad reviews hurt and, more importantly, so did word-of-mouth. By July of 1948, less than ten months after it arrived, ALLEGRO was gone. The show failed to pay back its original production costs, and a national tour that visited 16 cities from November ’48 to June of ’49 didn’t fare much better, either critically or financially.